...offers you a unique selection of Switzerlands rarest and most delicious alpine honeys. We personally know all of our beekeepers and the places where the bees collect the precious pure nectar. 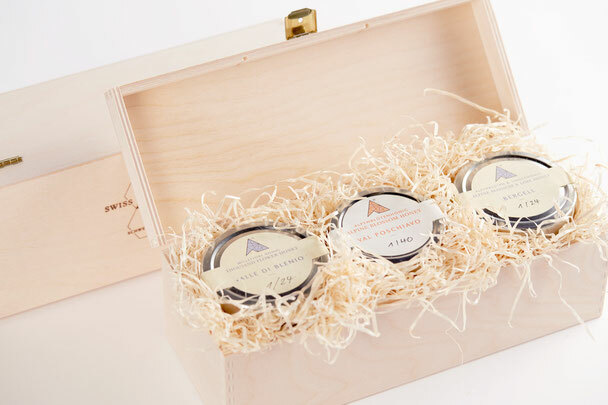 Our honey is harvested and filled in design jars directly by the beekeeper in the Alps and made available to you in small batches by a family owned dedicated business. We act locally, responsibly and do our business with full transparency so you can be sure about what you get - it's the best we can offer! We have carefully selected regions all over the Swiss Alps where the bees live in unspoiled surroundings far away from pesticides, antibiotics, traffic or other sources of pollution as honey is always the truest fingerprint of the region where the bees select their nectar. Honey is an all natural product built on trust. Nothing added, nothing taken away. We personally talk to our beekeepers, visit their bee hives and let them explain how they work. And only if all of our expectations meet, we partner for the good of both. The most important criteria for us is the quality of the honey in the glass - and the satisfaction of our customers! We respect labels , but do not use them to decorate our glasses. Customer satisfaction is the best and most sustainable, relevant label we can think of.